Originally built as a dining hall for King Edward IV in the 1470s, the Great Hall is a survivor of the medieval royal palace that once stood on the site and later become incorporated into the Art Deco home created by Stephen and Virginia Courtauld in the 1930s. The hall, which is comparable in size to that of Hampton Court Palace, was designed by Thomas Jordan, chief mason to the king, and Edmund Graveley, his chief carpenter. It is 101 foot long and 36 foot wide and has a magnificent oak roof described as a ‘false’ hammerbeam construction (the ‘false’ because the posts are morticed into the ends of the hammerbeams rather than resting on them). The hall would have once had a raised dais at one end while the other end joined to the rest of the would have featured a screen behind which doors led to a buttery, pantry and kitchen. 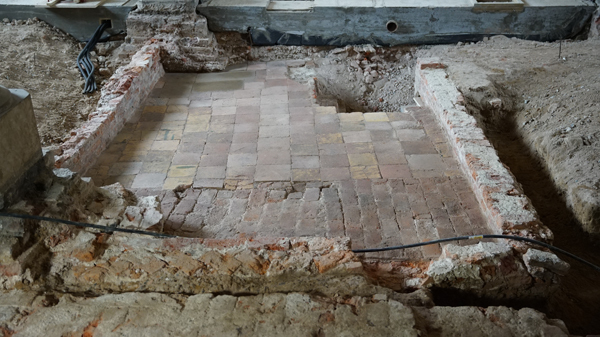 A hearth was located near the dais end of the hall. 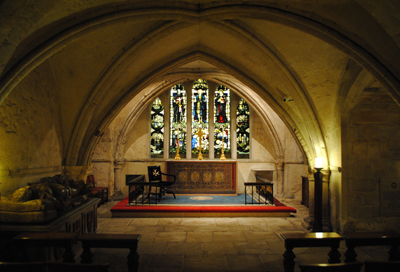 The windows, which are set high in the walls, would have been of stained glass (the stained glass there now was added in 1936 and is the work of George Kruger Gray) and the walls below them would have been decorated with tapestries. 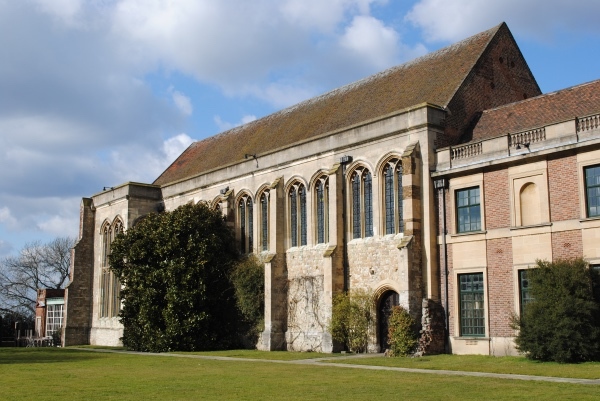 Eltham was a favourite residence of King Edward IV and one of the most lavish feasts ever held there was at Christmas, 1482, when some 2,000 people were fed (it was the king’s last visit to the palace before his death the following April). The hall would have also been familiar to King Henry VIII who spent much of his childhood here but later in his life rarely came to Eltham. 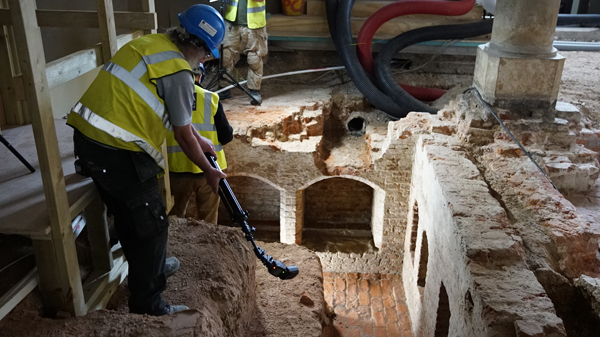 King Charles I was the last king to visit the palace and in 1651 it was sold off by Parliament to Colonel Nathaniel Rich who, as well as demolishing many buildings, stripped the lead off the hall’s roof. The property was later used as a farm and the hall became a barn. In the early 19th century a campaign was launched to save the hall from demolition which saw the roof propped up and during the latter half of the 1800s it was used as an indoor tennis court. 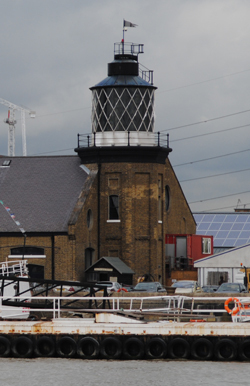 Further repairs were made in the 1890s and again between 1911 and 1914 when the roof was dismantled and reassembled under the direction of the Office of Works. The Courtaulds, who had their spectacular adjoining property built in the 1930s, apparently intended to use the hall as a music room and carried out a number of repairs – including to the roof – and additions including a minstrel’s gallery (there is no evidence of such a feature in the original). After World War II, the Ministry of Works assumed responsibility for the Great Hall (and other palace remains) – opening the hall to the public for three days a week – before in 1984 English Heritage took over management of the Great Hall (and later the entire site). WHERE: The Great Hall, Eltham Palace, Court Yard, Eltham, Greenwich (nearest train station is Mottingham); WHEN: 10am to 6pm Sunday to Friday; COST (without Gift Aid): £15 adults/£9 children/£13.50 concessions/£39 family (English Heritage members free); WEBSITE: www.english-heritage.org.uk/visit/places/eltham-palace-and-gardens/. We’re skipping upstream, past a few islands this week, to take a look at Thames Ditton Island which lies in Kingston Reach, above Teddington Lock. The island is the largest of a group of three which also includes Swan Island (the smallest) and Boyle Farm Island. Located opposite the grounds of Hampton Court Palace (built by Cardinal Thomas Wolsey in the early 16th century and then, following his fall from grace, claimed by King Henry VIII in 1525), the 320 metre long Thames Ditton Island owes its existence to King Henry who had the river widened and straightened here so that he could use the river for an uninterrupted journey up the river from Westminster to Hampton Court. In doing so, the island was created. Used as pasture land for the local manor (and known apparently at one point as Colly’s Ait, ait being a word for a river island, before being renamed Thames Ditton after the village on the west bank) for several centuries, the island became a popular recreation spot for the wealthy interested in water sports during the Edwardian era, thanks to the arrival of the railway in the area in the late 19th century. 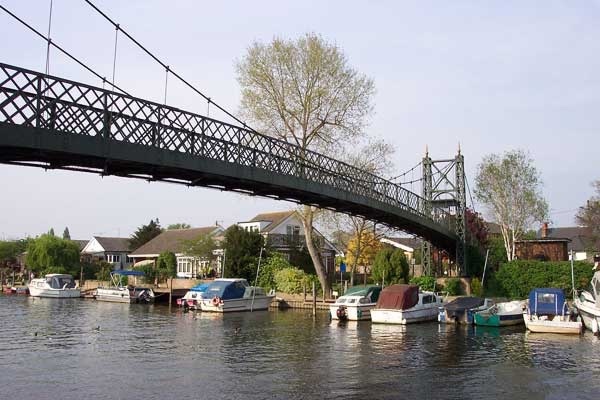 The island is these days connected to the Thames Ditton bank by a 1930s suspension bridge which ends near the 13th century Ye Olde Swan pub. It is now home to more than 45 rather exclusive riverside properties (almost all are in stilts to help ward off the danger of flooding, a phenomenon with which long-term residents in the area are familiar). Swan Island, while lies just to the south of Thames Ditton Island, is tiny and the location of the home of the ferryman, who up until 1911, would take people across the river to Hampton Court. Further to the south likes Boyle Farm Island which also has a single house open it. It stands opposite the mainland property formerly known as Boyle Farm but now a nursing home known as the Home of Compassion. Interestingly, while Thames Ditton Island is part of Greater London, Boyle Farm Island is part of Surrey (along with Thames Ditton village). 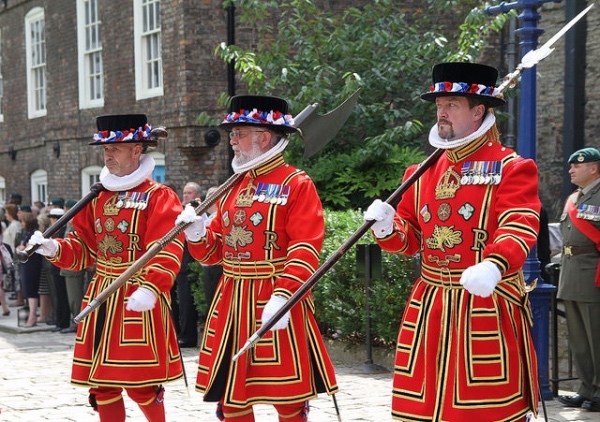 Tradition holds that the spot where this officially protected view originates from – the prehistoric barrow known as King Henry’s Mound – was where King Henry VIII stood on 19th May, 1536, to watch for a rocket fired from the Tower of London. 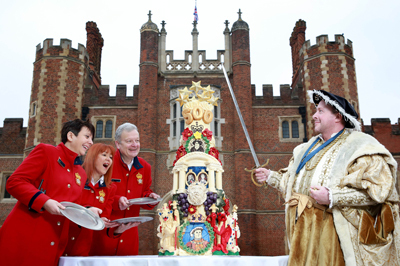 The signal was to indicate that his former wife, Anne Boleyn, had been beheaded for treason and hence that he was now free to marry Jane Seymour. 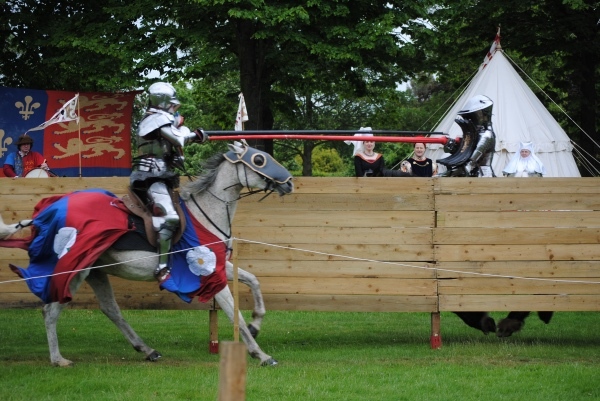 Sadly, the story is seen as unlikely – the king was apparently in Wiltshire at the time. 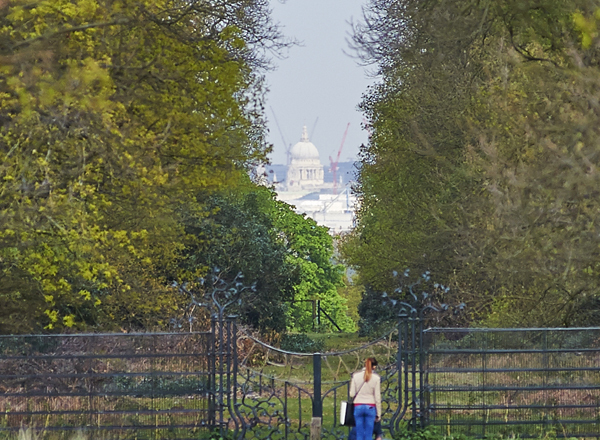 But it adds a nice nostalgia to this tree-framed view which looks across Richmond Park and areas south of the River Thames to the great dome of St Paul’s Cathedral. The mound, which also offers views west over the Thames Valley towards Windsor, is believed to cover a burial chamber from the Bronze Age (it would have stood more prominently over the Thames Valley in those days) and was later used as a viewing position for hunting deer and falconry. A permanent public telescope has been set up on the mound which since the 19th century has sat in Pembroke Lodge Garden (named for the Countess of Pembroke who lived in a cottage here between about 1788 and 1831). The historic view made headlines last year over calls for London’s Mayor to step in and halt building work amid concerns that the 42-storey Manhattan Loft Gardens tower in Stratford, east London, could be seen in the view behind the cathedral dome. Standing some 200 feet above sea level (almost 63 metres), this rounded grassy hill, just to the north of The Regent’s Park proper, has long held a fascination for Londoners partly, at least, for the panoramic views it offers of the city skyline. 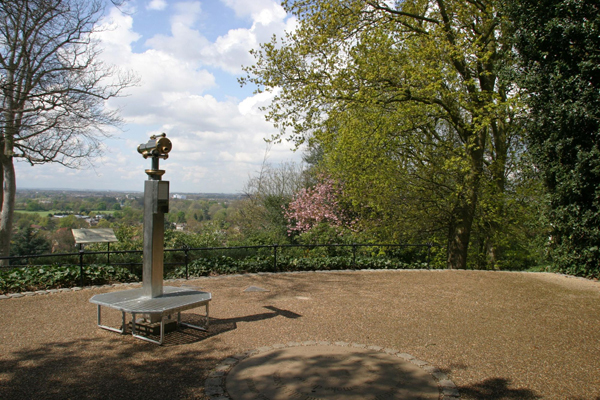 Once part of a hunting ground used by King Henry VIII, the hill – which has also been known as Battle and Greenberry Hill – was purchased in 1841 from Eton College to provide more public space for Londoners. 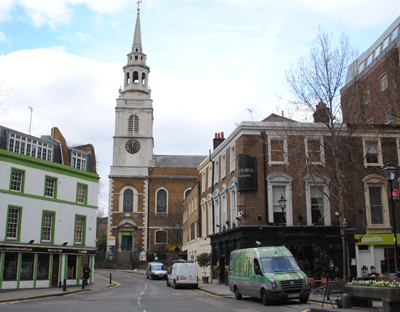 It has served as the site of a famous unsolved murder (that of magistrate Sir Edmund Berry Godfrey whose mysterious death, exploited by anti-Catholic plotter Titus Oates, caused considerable uproar) as well as duels, prize fights, mass gatherings and mystic happenings. 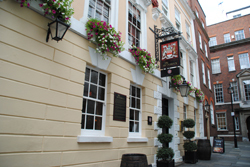 The latter have included it being the location where Edward Williams (Iolo Morganwg) first organised a gathering of druids, known as a Gorsedd of Bards, in 1792, as well as it being the subject of a prophecy by 16th century ‘soothsayer’ Mother Shipton warning that the streets would “run with blood” if the hill should become surrounded by urban sprawl. 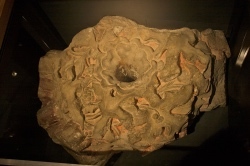 Around the summit of the hill stands a York Stone edging feature bearing an inscription from poet William Blake – “I have conversed with the spiritual sun. 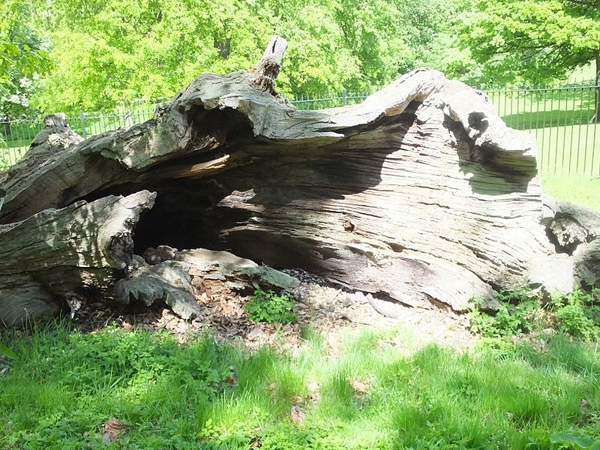 I saw him on Primrose Hill” – while standing on the slope below is the famous Shakespeare’s Tree which was originally planted in 1864 to mark the 300th anniversary of the Bard’s birth (but was replaced in 1964). The view over London is one of a number of protected views in the city (meaning you can’t build anything block it) and the trees below the summit are kept deliberately low so as not to impede sightlines. 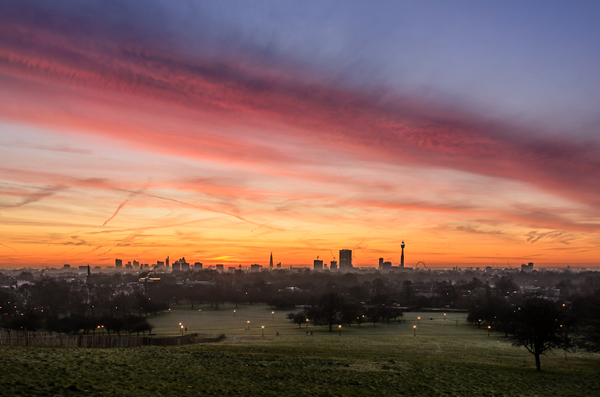 The nearby residential district known as Primrose Hill is noted for being home to numerous famous figures including the likes of Jude Law, Kate Moss and the Gallagher brothers. It is also where the aliens in HG Well’s book, War of the Worlds, intended making their headquarters. WHERE: Primrose Hill, The Regent’s Park (nearest tube stations are Chalk Farm, Swiss Cottage, St John’s Wood and Mornington Crescent); WHEN: Usually always; COST: free; WEBSITE: www.royalparks.org.uk/parks/the-regents-park/things-to-see-and-do/primrose-hill. PICTURE: Mike Rolls/Flickr/CC BY-SA 2.0 (taken in 2012). 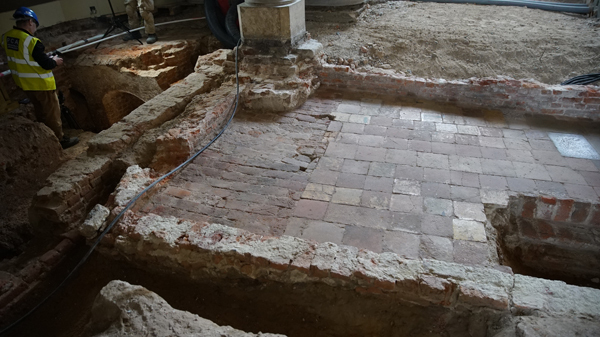 One of the achievements of the short-lived reign of King Edward VI, son of King Henry VIII, was the establishment of this hospital for orphans in 1552 in what were once buildings used by the Greyfriars Monastery (for more on the history of Greyfriars, see our earlier post here). Located in Newgate Street, the hospital soon had a school attached which became known as the Blue Coat School thanks to the distinctive long blue coats the students wore (and still do, the school is now located near Horsham in West Sussex). 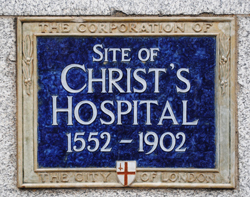 Many of the hospital buildings were destroyed in the Great Fire of London of 1666 but most were later rebuilt under the supervision of Sir Christopher Wren, although the actual work was apparently carried out by others. Students at the school have included antiquarian William Camden, Romantic poet Samuel Taylor Coleridge and writer Charles Lamb. New buildings for girls were opened in Hertford in 1704 and the school moved out to Sussex in 1902 with the General Post Office built over the top of the demolished buildings. Famed as the court painter of King Henry VIII, Hans Holbein the Younger was one of the greatest portrait painters of the sixteenth century. Born in Augsburg, in southern Germany, in 1497-98, Holbein was the son of painter and draughtsman Hans Holbein the Elder. Hans, like his brother Ambrosius, followed the family trade which he apparently learnt under the tutelage of his father and uncle until breaking away to make his own mark. Journeying with Ambrosius to Basel in what is now Switzerland, the two brothers became apprenticed to the city’s leading painter Hans Herbster. In 1517, Holbein went with father to Lucerne where they worked painting murals for a leading merchant. It is thought while there, that he visited northern Italy where he studied Italian frescos. Returning to Basel in 1519, he quickly re-established his business there, becoming a member of the artists’ guild, and married Elsbeth Schmid, their first son arriving in the first year of their marriage (the couple apparently had four children, two of whom are depicted in a portrait with his wife he painted in the late 1520s). He was soon completing numerous major projects for the city – including painting internal murals for the Town Hall’s council chamber – and was also involved in creating illustrations for books – the most famous being the series of images known as the Dance of Death – and painting portraits, including his first portraits of the Renaissance scholar, Erasmus. It was these and other portraits that ensured his fame across Europe. The decline in the production of religious art, thanks to the Reformation which was then sweeping over the continent, apparently led Holbein to look further afield for work and, having first gone to France, in 1526 he went to England. There he was welcomed by Sir Thomas More, then a key figure in the regime of King Henry VIII, who soon found him some commissions. His works during this period included portraits of More, William Warham, Archbishop of Canterbury, astronomer Nicholas Kratzer and courtiers like Sir Henry Guildford. 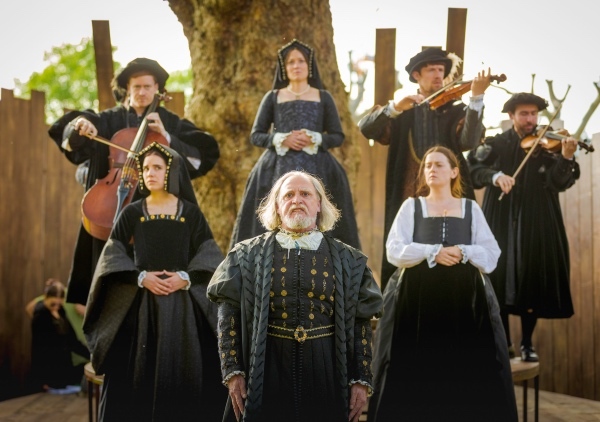 He returned to Basel a wealthy and successful man in 1528 and remained there for four years before once again leaving his family and heading to England, this time finding favour with the Boleyn family and Thomas Cromwell. 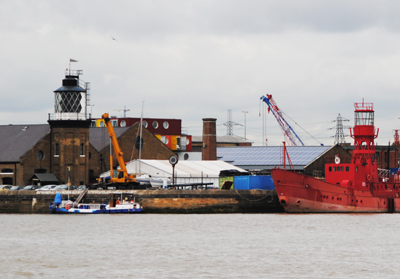 It was early during this period – he remained in England until his death in 1543 – that he painted portraits of Hanseatic League merchants of the Steelyard (see our earlier post here) as well as The Ambassadors (see our earlier post here). In 1536, he was employed as painter to King Henry VIII and the following year he painted what is arguably his most famous image – that of King Henry VIII in all his glory in the image known as the Whitehall Mural which pictured the king with his the wife, Queen Jane Seymour, his father, King Henry VII and his mother, Queen Elizabeth of York (the image was lost in the fire which destroyed Whitehall Palace in 1698 but copies were made and a copy is now at Hampton Court Palace). King Henry VIII was to be his subject on numerous occasions as were other members of the Royal Family, courtiers and prospective wives including, famously, a portrait of Anne of Cleves which may have oversold her beauty to the king who was unimpressed with her in person (there is apparently no evidence the king blamed Holbein himself for this). While he had successfully navigated his way past the downfall of Sir Thomas More and then the Boleyn family, the fall of Sir Thomas Cromwell did cause significant damage to his standing. 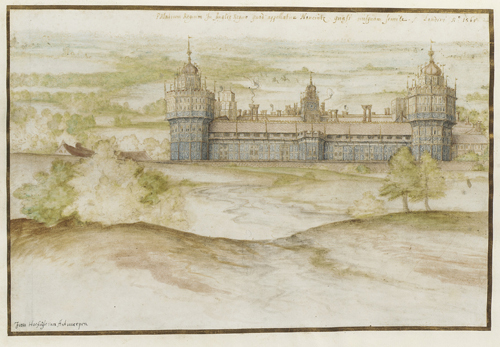 Nonetheless he retained his official position at court and it was during this time that he painted some of his finest miniatures including those of the sons of Henry VIII’s friend, Charles Brandon, 1st Duke of Suffolk. It is believed Holbein may have returned to visit his family in late 1540 before returning to London where he died sometime in October or November, 1543, having made his will on 7th October at his home in Aldgate (plague has been suggested as the cause of his death). 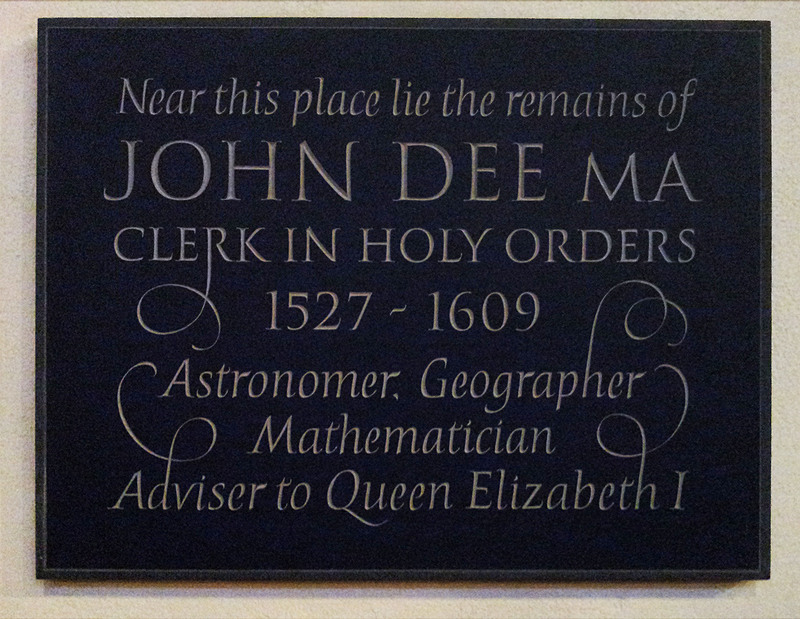 The site of his grave is unknown. Holbein’s legacy is such that the portraits he created in his two stints in London have become a key component in how we view Tudor England – and in particular, the Tudor court – today. 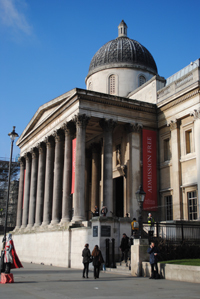 His works can be seen in key locations across London including the National Gallery (pictured above), the National Portrait Gallery (where his bust is one of a series of artists on the exterior) and Hampton Court Palace. 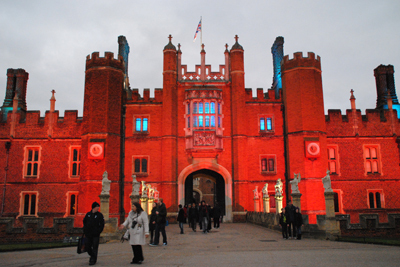 WHERE: Hampton Court Palace, East Molesey, Surrey (nearest station is Hampton Court from Waterloo); WHEN: 10am to 6pm until 24th October after which it’s open to 4.30pm); COST: Adult £19.30, Concession £16, Child under 16 £9.70 (under fives free), family tickets, garden only tickets and online booking discounts available; WEBSITE:www.hrp.org.uk/HamptonCourtPalace/.